You too can rent your very own Latino! Yemaya’s Fire is dedicated to producing culturally relevant programming. Have a budget but need ideas for programming? The folks at Yemaya’s Fire have years of experience in event planning and production. An integral part of the collegiate experience is exposure to keynote speakers and performers. As an administrator you may spend countless hours trying to identify and secure a dynamic lecturer who can appeal to the unique needs of today’s diverse student population. With Yemaya’s Fire™ as your partner you can significantly decrease your search time. Yemaya’s speakers represent the entire spectrum of the African Diaspora. Need a Black and Latino speaker…here is the place! Yemaya’s Fire is the official booking agency for Shaggy Flores. Mr. Flores is a dynamic lecturer and poet who has traveled to universities and colleges throughout the country capturing the attention of audiences. By weaving discussions about history and culture with poetry, Shaggy Flores is able to present a one man performance that mesmerizes audiences. 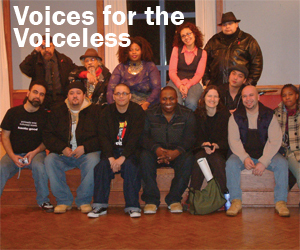 Accept no imitations, Yemaya’s Fire is the only production company for the Voices for the Voiceless™ poetry concert! Want to bring the official event to your campus, contact us. Need to contact Shaggy Flores, fill out the form below.